Here's my take on traditional Santa Maria-style beans. Serve these with your tri-tip and chicken for a true taste of California barbecue. I've tried a few variations and this recipe is the current front-runner, but of course I'll continue to experiment. Heat a stock pot over medium heat, add the bacon and cook until it just starts to crisp on the edges. Drain half of the rendered fat. Add the onion and cook for about five minutes, or until the onion is translucent. Add the garlic and cook one minute longer. Pour in the beer and water, bring to a low boil for five minutes, then reduce the heat to a simmer. Add the remaining ingredients and bring back to a simmer. Reduce the heat to medium-low, cover and cook for an hour, stirring occasionally. These sound delicious! I will definitely give these a try. are those pinquinto beans like/the same as ranch beans? Chris - No, the Ranch Style Beans are pintos. Here's some background on pinquito beans. This sounds like the perfect side for BBQ. i'll have to try it out someday! Just made these last night with some tri-tip sandwiches. Awesome! Definitely my new go-to bean recipe. Toronto BBQ Catering - Thanks! I'm glad that you like them. I great up on the Central Coast of CA and had this style beans (with SM Tri Tip MANY times). These beans are great. They brought back such a wonderful taste memory. 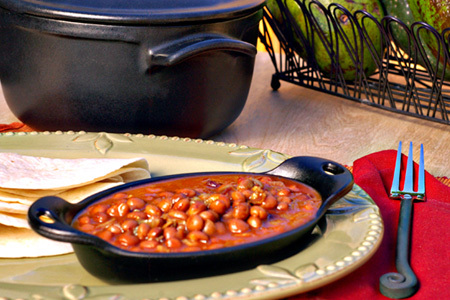 This is my "go to" recipe for baked beans now. Perfect blend of spice, salt and sweet!